Today agents are working with customers through voice, email and chat. As a manager you need to track the status and performance across these channels to ensure the agents continue to meet their goals and objectives. 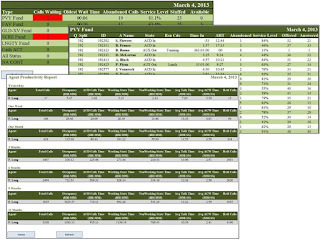 Furthermore, as a manager, you are watching performance for your multiple groups (divisions / departments). Creating these reports may not be an option for the manager based on the total costs, compatibilities or capabilities. Multi-channel data on a report needs to be defined by what it is trying to accomplish. Managers want to know the agents status across all channels, voice, email and chat. The report needs to show the group status, then the option to select the group to see the agent status for that group, and then select the agent to see the agent status and performance both in real time as well as a historical report. The immediate reaction to this report is this is a report I have today in my system if I just take the time to organize it and run the report. Remember this is a multiple group report combining data from separate skills or queues and across multiple ACD’s. Global call contact centers have combined data for the groups that have agents in multiple global contact centers. Working State Time – combines talk time; wrap up time and Aux states that are considered to be productive. These codes will vary by contact center. Non working State Time – combines all non working states time to show how unproductive the agent has been. Lunch, break, idle, logged out, etc. are all examples of non productive. Because your agents are working with customers via voice, email and chat you need to see their performance at each level. What is their status for each of these? What is the work time for each of these? Are they logged into these channel options? This status report contains data collected from Email, Chat and Voice that is combined across multiple ACD’s and groups. The purpose is to see how the agent is performing through three channels and to ensure they are not using one channel to justify lack of performance in another channel. 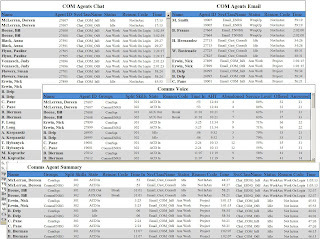 Combining Group totals for the channels (voice, email and chat) also shows the manager how well the international call centers are performing. These reports are different from the standard reports that are available from the ACD provider. 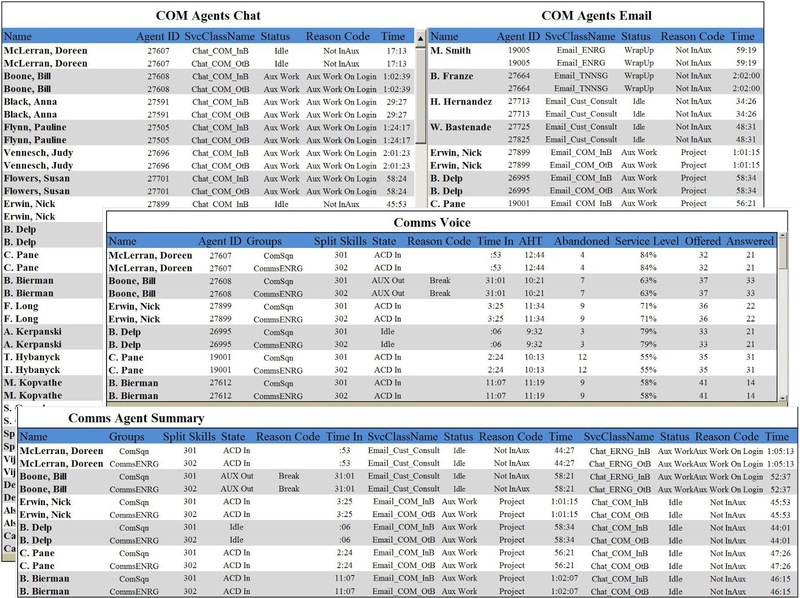 These combine data across channels: Voice, Email and Chat; from multiple ACDs; and creates group level reporting. 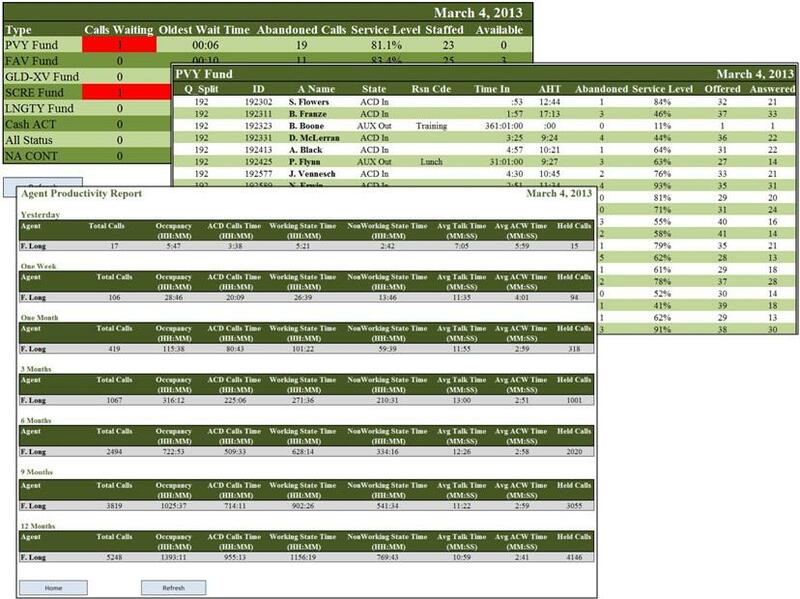 These collaborated reports give managers the tools they need to see real time and historical status for agents that work on numerous tasks as part of their job.